Citrus Heights, CA - February 11, 2019 /MarketersMedia/ — The United States Commerce Department reported the construction industry witnessed a spending increase in November 2018. Furthermore, the Bureau of Labor Statistics found that 52,000 construction jobs were added to start 2019 off right. Finding the right person for these positions and the right employer for each worker can be challenging, however. 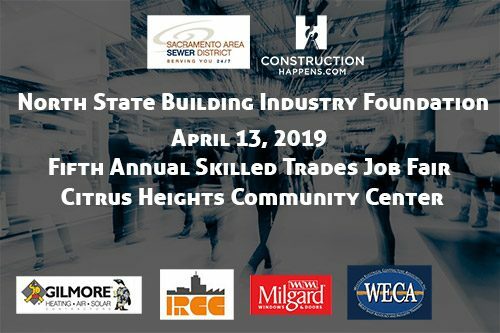 Find Construction Jobs easily or locate the right workers for each position with the help of the Skilled Trades Job Fair April 13, 2019. "The job fair features not only skilled trades positions but support and professional positions as well. This includes positions in scheduling, office support, and project management. Our goal is to connect job seekers and employers from all over the Sacramento Region," Nick Attardi, spokesperson for Construction Happens, explains. The wildfires in California demonstrate the importance of the construction industry. Many homes were destroyed in these fires and families displaced. As the rebuilding process moves forward, the construction industry will need workers to take on numerous positions to help these families recover from the disaster. This is only one of many reasons why construction jobs remain in high demand. "We love the great state of California and want to ensure everyone who wishes to live here can. However, disasters such as the wildfires often bring about a housing shortage. With the help of this job fair, employers and workers can connect to make certain positions are filled in a timely manner and the rebuilding process can move forward quickly," Attardi continues. However, this isn't the only type of construction that will be taking place in California in 2019. For instance, many construction workers plan to head to the Los Angeles area to help in the construction of a new NFL stadium. This may lead to a shortage of workers in other areas of the state, and the job fair hopes to help individuals find jobs that meet their particular needs while allowing employees to connect with workers who have the skills they need to remain competitive. "Local Construction. Local Jobs. Sacramento has a great deal to offer for all, and we want to ensure the region continues to grow and thrive. With the help of this job fair, we can help to ensure this is the case," Attardi states. The mission at ConstructionHappens.com is to connect contractors with highly qualified employees and tradesmen within their local region.